The unique luxurious brand W Hotels, part of Marriott International, Inc held the grand premiere of W Xi'an on November 15, thus bringing a brand new sensory feast to Xi'an, the charming ancient oriental capital with profound significance and all-inclusive characteristics. W Xi'an is located in the Qujiang new district and combines modern and historic elements. It injects the particular aspects of the W brand, including design, fashion, music, and vigor into Xi'an, Shaanxi Province, an ancient civilized capital with a long history. Inspired by the local culture of Xi'an, W Hotel has created three customized cocktails to celebrate the opening of W Xi'an, which are served in many W Hotels to give guests a sense of history and culture of the ancient city, and a passionate collision with its contemporary culture. "The premiere of W Xi'an will lead you to the prosperous Tang Dynasty. 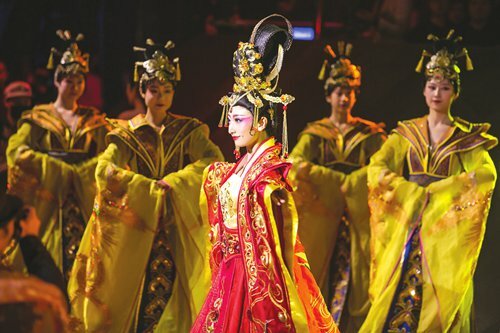 We invite you to enjoy the exciting performances, join the party in China to touch the pulse of the ancient capital and feel the passion and vigor of the contemporary Xi'an," said Jerry Mong, general manager of W Xi'an. trend. The twisty and irregular elements fill the hotel, thus breaking the fixed impressions and show an unpredictable journey through space and time. Upon entering the hotel, it feels like being back in the Tang Dynasty as a witness to the spectacular view of Chang'an. The hallways appear as a maze in which time could be interchangeable. Silver wavy streaks encompass the entire space. The 17-meter-tall abstract glass swirl suspended in the air introduces the ever-flowing light into space. Chinese and western swirls collide to create great sparkling momentum and the design's influence dates back to ancient palace walls and the Silk Road. The vigorous arc-curved walls rise from the ground, thus leading guests to the reception desk. With Tang warriors as the artistic prototype, the orderly pottery figurines depict ancient acrobatics at an "exceedingly high bar." The figurines vividly portray the highest welcoming etiquette of the Tang Dynasty- when the grand occasion of hundreds of dancers and musicians extended a warm invitation to guests. W Hotels advocate a lifestyle of working hard, having fun and never getting tired. W Xi'an owns a 4,000 square-meter activity room and a large-scale banquet hall consisting of three floors with an area of more than 2,300 square meters making the rooms ideal places for diversified business talks and individualized weddings. The entrance area of the banquet hall is a 50-meter gated-wall. Opposite the wall is a bar with the concept of a crystal cave. Within the banquet hall, the ceiling is filled with peony echoes and splendid stars, thus creating a beautiful sense of stereo space to arouse guests' memories of the prosperous social life in the Tang Dynasty.